If you are a die-hard fan of pastry god (at least in my eyes but everyone else calls him the “Picasso of pastry”), Pierre Hermé, you should consider to go to Pierre Hermé Aoyama (Japanese website) in Shibuya, Tokyo. 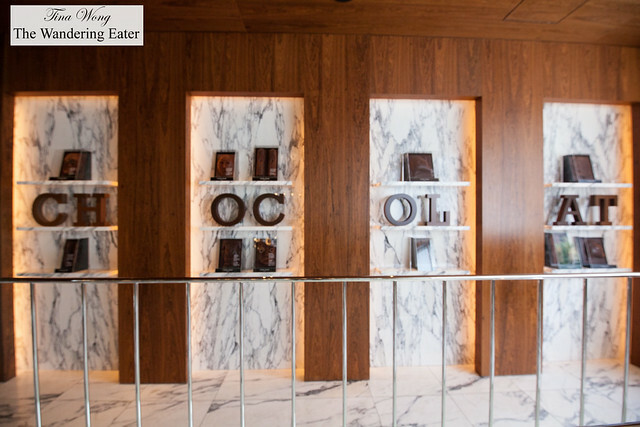 Reasons for this is because it is Tokyo’s flagship location; it’s bigger than its flagship in Paris on Rue Bonaparte (I’ve been there in 2010) and comes with a sit-down café called Bar Chocolat on the second floor. No other Pierre Hermé boutique has a sit-down café to enjoy the beautiful and sometimes wonderfully unusual flavor combination pastries and plated chocolate desserts. 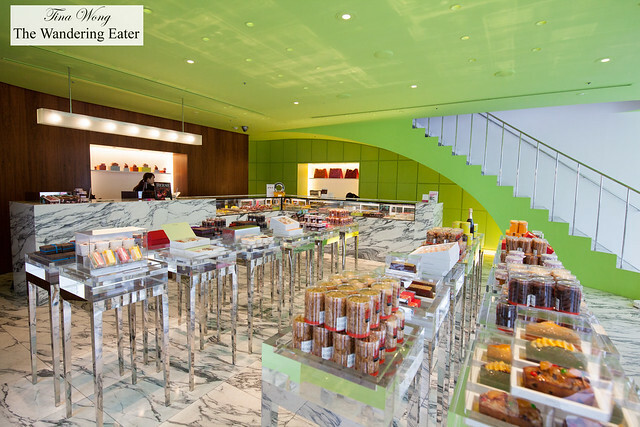 This Pierre Hermé Paris location opened in February 2005 where it had combined the two concepts: the luxury convenience store and upstairs is the chocolate bar and salon. 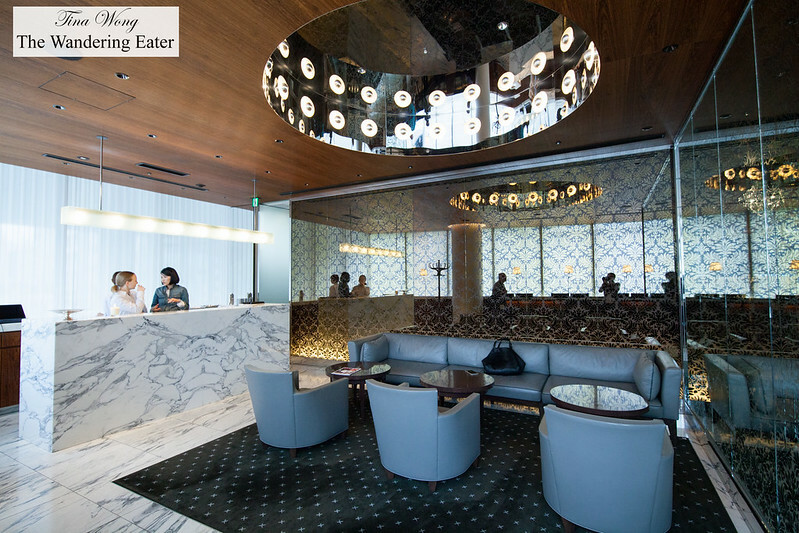 This location is not too far from the luxury department stores and fashion boutiques in Shibuya. 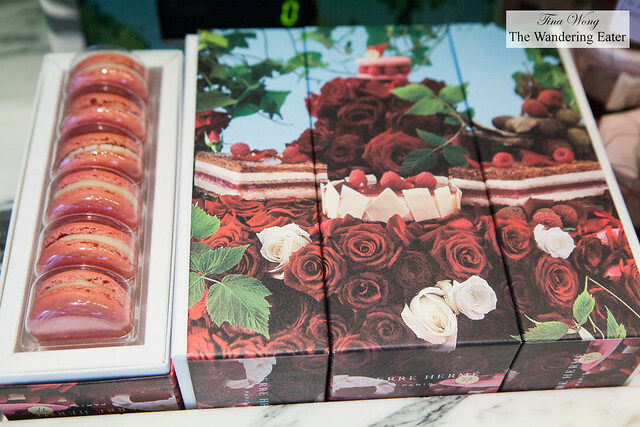 The luxury convenience store aspect is luxurious starting with Hermé’s pastry masterpieces and rainbows of macarons in gleaming refrigerated glass cases, beautifully packaged chocolates and cookies, and expands to chilled fine Champagnes, Christine Ferber jams collaborated with Pierre Hermé Paris, fine teas and other products that is great for gifts or a gift for yourself. Climb up the sleek staircase at the back of the shop leads upstairs to the gilt and glass chamber of Bar Chocolat, the patisserie’s salon devoted to primarily chocolate. A mirrored dining area holds just three tables, with a row of bar stools looking down onto Aoyama-dori. 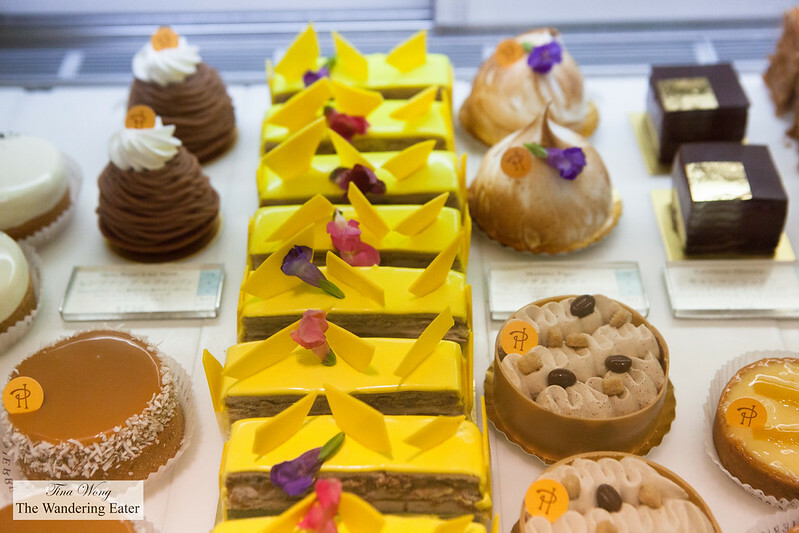 We took the opportunity to have a sweets filled afternoon and had Hermé’s sublime desserts. 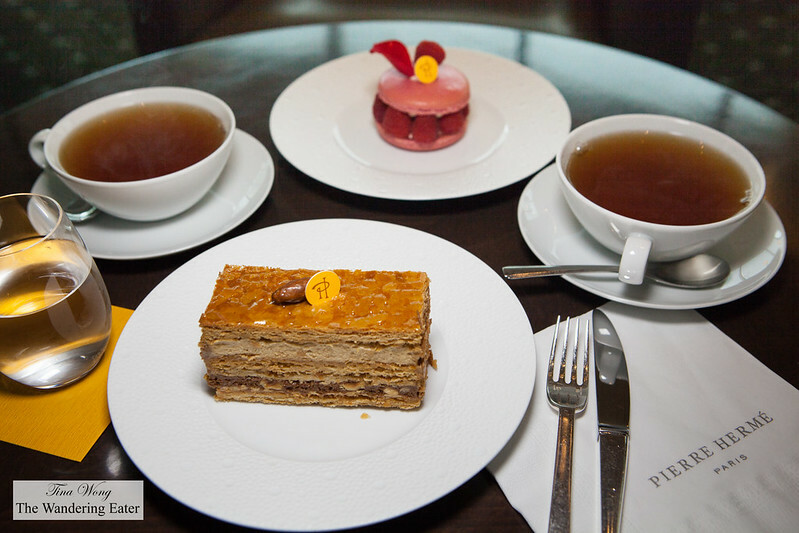 We had delicious cups of Thé Jardin de Pierre, the classic Ispahan and 2000 Feuilles pastries. 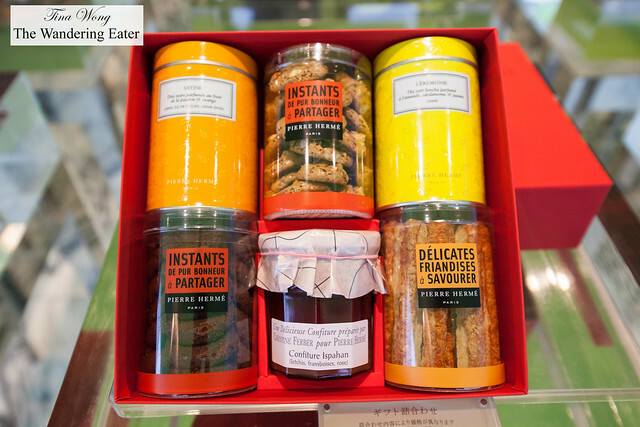 The Jardin de Pierre tea is Ceylon based that had aromas and notes of citrus, jasmine, rose and violet. 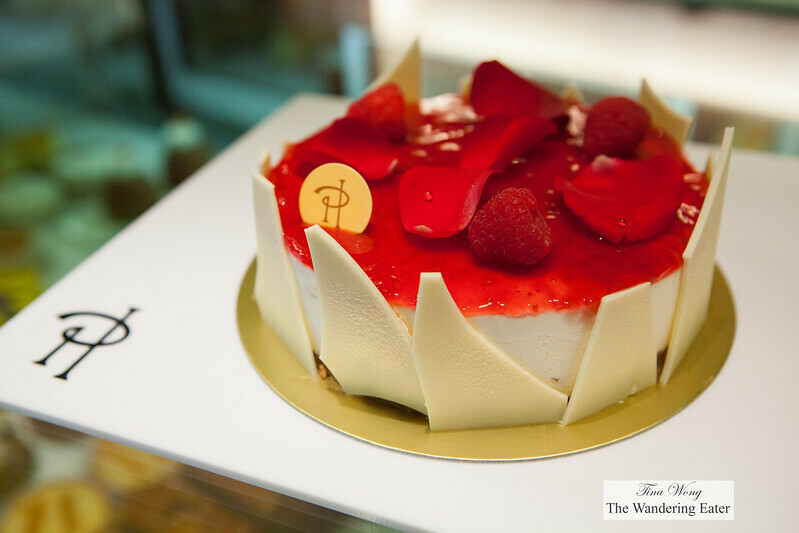 The signature Ispahan from Hermé I will never be bored of. I’ve eaten this many times over the years and I still am moved to how delicious, distinct yet harmonious flavors of rose, raspberry, and litchi is. Others will imitate but it doesn’t always consistently blow my mind. 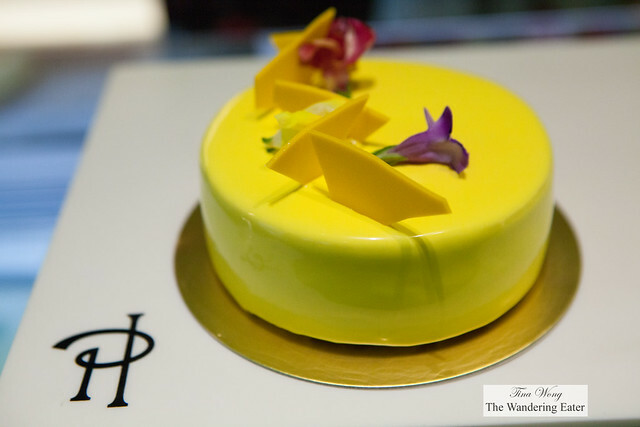 The 2000 Feuilles is another classic Hermé pastry. It’s a take on the millefeuille: caramelized puff pastry and crushed hazelnuts contrast with the creaminess of the praline mousseline cream. Crispy, buttery caramelized leaves of pastry with the utterly smooth pastry cream was simply delicious. 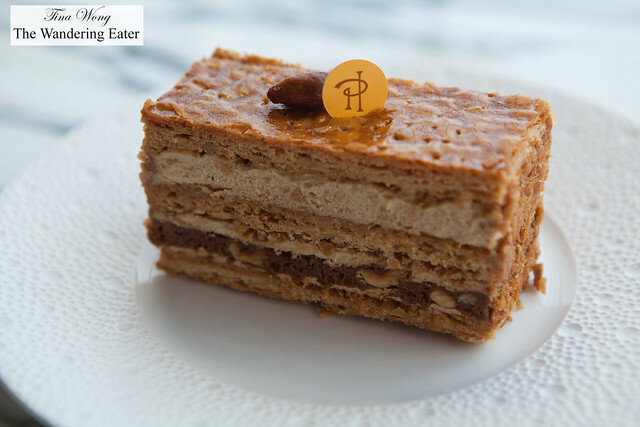 The nutty praline flavors and touch of milk chocolate worked wonderfully with the caramelized puff pastry. 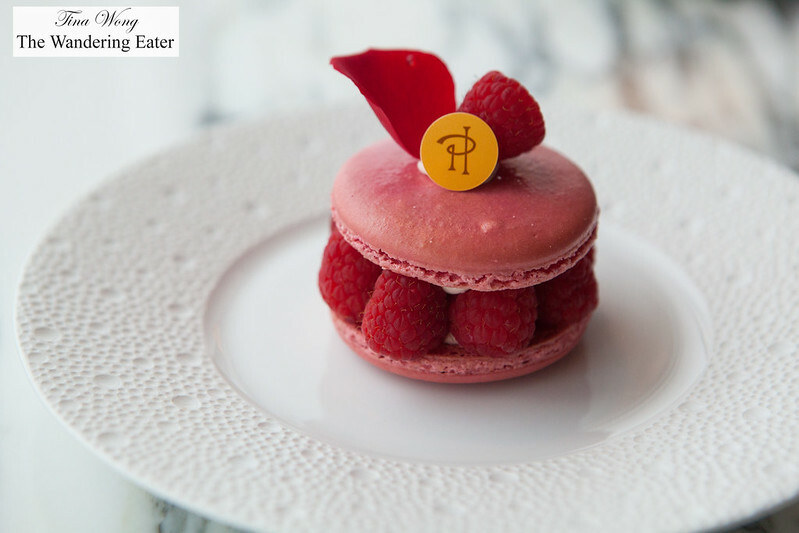 Since the Ispahan is the beloved, signature flavor of the chef and brand, it’s also part of the “Fetish” collection. 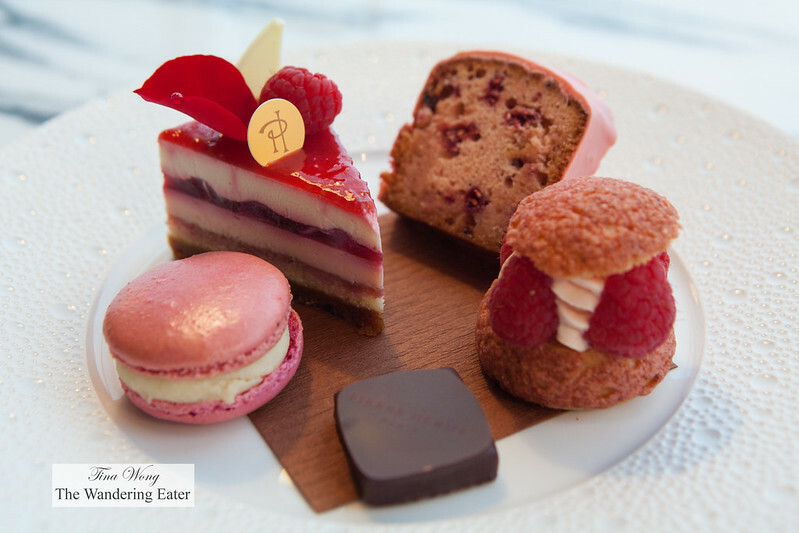 The salon has a plate of a portion of the Ispahan collection that includes a chocolate bonbon, macaron, pound cake, cheesecake and choux. Not surprisingly, we loved everything on that plate. 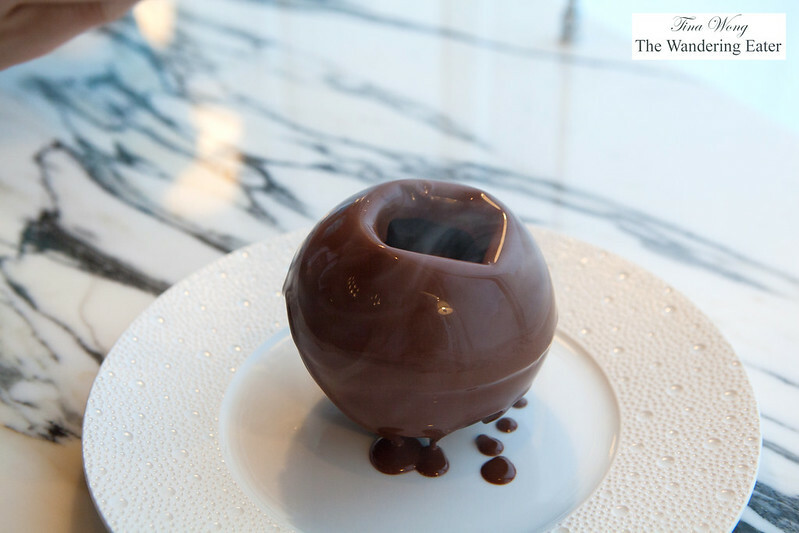 I’m amazed how that one flavor is implemented in its many variations and still maintain its distinctive flavor with its different vessels (cake, chocolate, meringue via macaron, etc.). 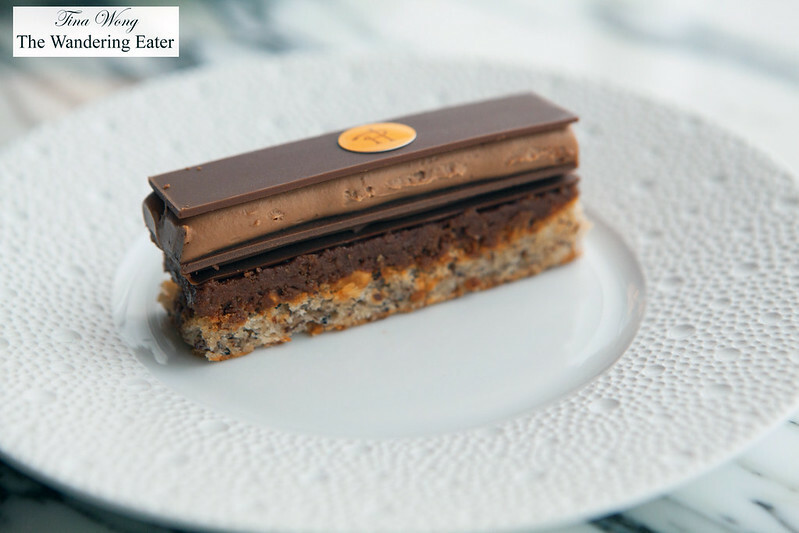 The Plaisir Sucré was based on developing a pastry with milk chocolate and a variation crispy textures, crunchy, soft and melting and therefore sensations. 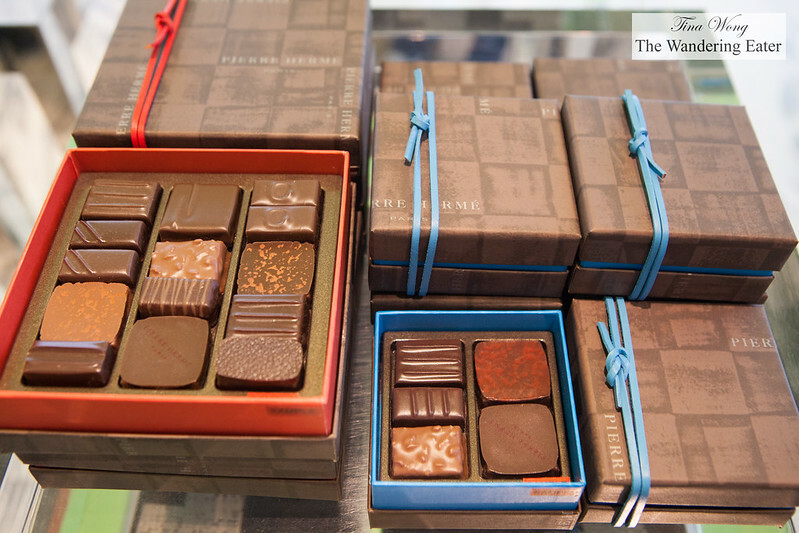 Back when Hermé developed his recipe, milk chocolate was an underrated type of chocolate and he wanted to show to the world that milk chocolate is delicious and complex. 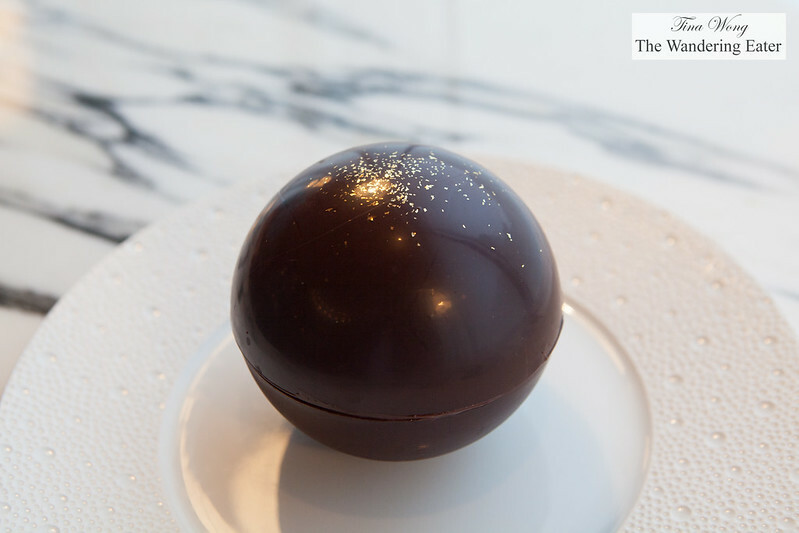 He uses a dark milk chocolate (a type of milk chocolate that has a high cacao content) and it’s made of layers of hazelnut dacquoise, praline cream, and thin sheets of milk chocolate. The kaleidoscope of macarons were spot on. This year’s 2015 collection is Le Jardins, inspired by nature and the creation of sweet pleasures. We had their recent releases like Macaron Velouté Infiniment Citron Vert (yogurt, lime), Jardin dans les Pins (Moutain and Scots pine buds infused cream filling), Jardin en Corse (Corsican Nepita and candied citron), and Jardin du Soleil (olive oil with orange). 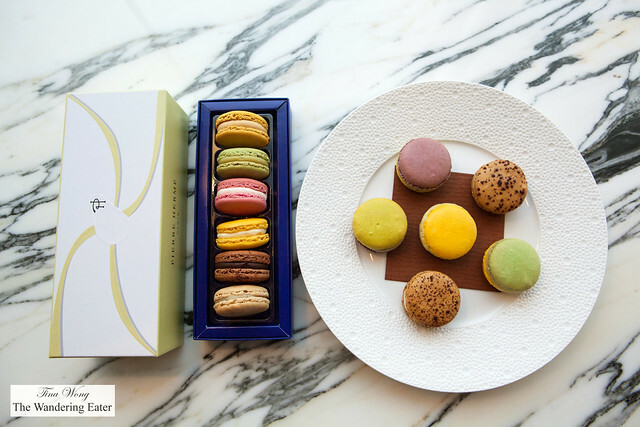 These unexpected flavor pairings from the Jardin line, especially the pine, amazes me how Hermé manages to make it palatable and tasty. Some transported me to the Mediterranean. My friend wanted to try an ice cream sandwich since it was a hot and humid day in Tokyo. We took on the suggestion of having the Miss Gla’Gla Satine. Miss Gla’Gla is the name of the macaron ice cream sandwich and Satine is the flavor combination of orange, cream cheese and passion fruit. 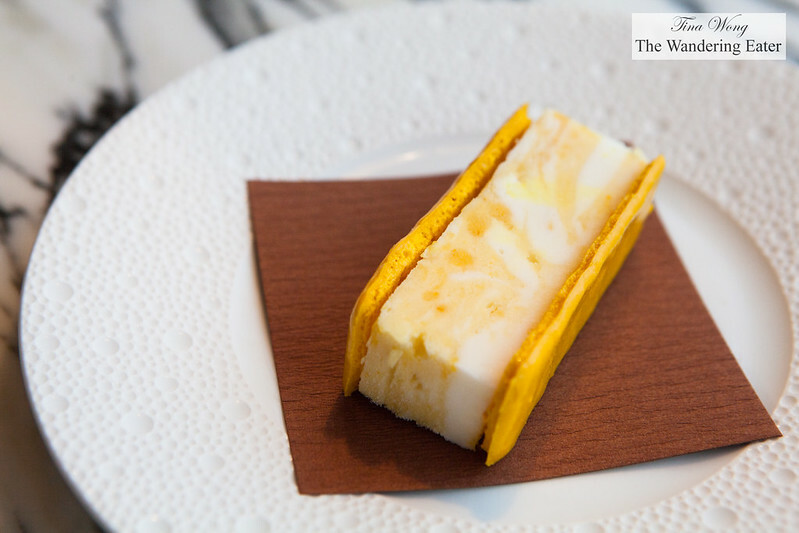 The citrus-y sweetness of the ice cream with the swirl of passion fruit sorbet to give it some vibrant acidity to the sandwich. The macaron shells added the lovely crisp texture. This is a crisp, hollow dark chocolate sphere of chocolate filled with dark chocolate ice cream, Araguani chocolate chips with fleur de sel, and chocolate French meringue. 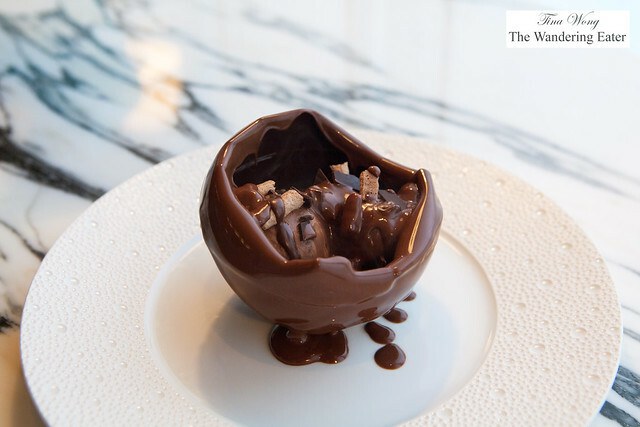 At tableside, you or your server would pour hot chocolate sauce and it would reveal the mentioned contents under that sphere. It’s a study in contrasts — hot and cold temperatures, smooth and creamy with crunchy and crisp. 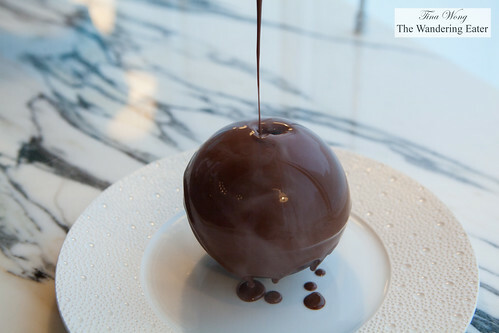 As a whole, it’s a decadent dessert aiming for the chocoholic. The other wonderful chocolate-centric plated dessert is called Initiation de Gouts, de Textures, et de Temperatures autour du Chocolat Azur (¥1944). 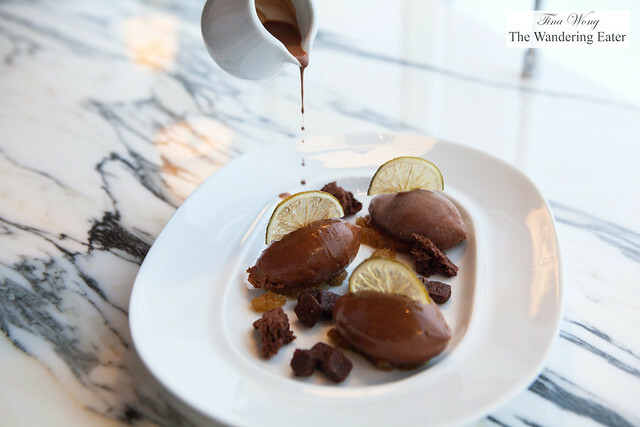 Essentially, that long name means a study of tastes, textures and temperatures around dark chocolate and yuzu. The chocolate used and studied here was the Valrhona Grand Cru Manjari 64%. This not too dark chocolate, nicely fruity and acidic chocolate was wonderfully paired with the signature Japanese citrus, yuzu. The cold quenelles of chocolate cream and ice cream, chocolate chips with fleur de sel, chocolate shortbread, biscuit, thin dried slices of yuzu, and drizzled with cold Manjari sauce. 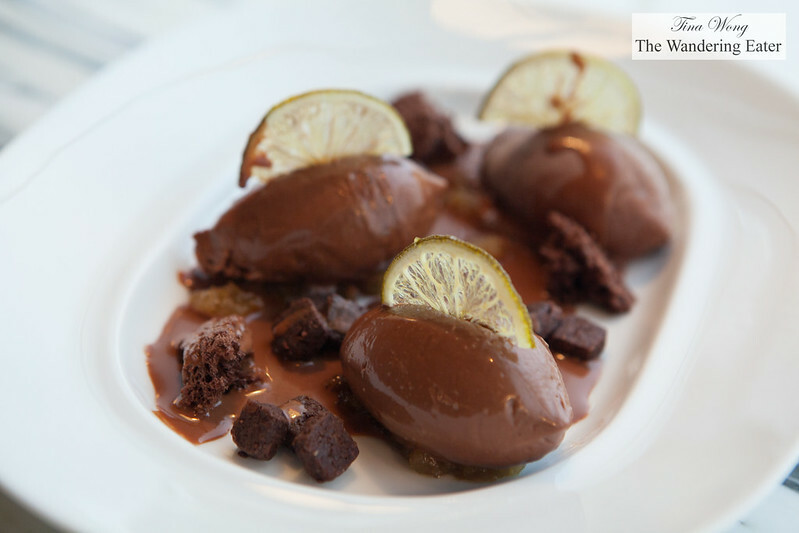 This is a rich, very chocolate-y dessert with pleasant touches of acidity from the yuzu. 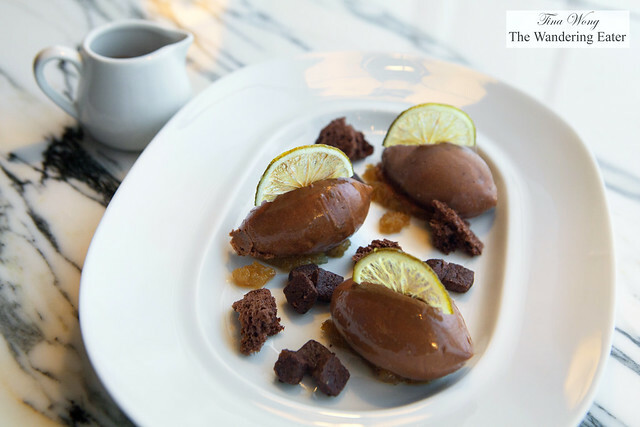 Both of these plated desserts can be easily shared with another person or two.